I weaved my way to the entrance, the lower level of a residential apartment building, trying not to step on the massive yellow lab standing sentinel at the front door. I glided past the waistcoated bartender with his melting bowl of ice and lonely bottle of cheap vodka that outlasted its mixers. I waited for him to wash out a few plastic cups that he happily filled with the remaining drudges of white wine and helped myself to a few Hershey’s Hugs that seemed out of place in the setting. Any feeling of pretense or discomfort dissolved as I went deeper into the gallery space and started focusing on the art present at the exhibition opening for Norte Maar’s current show, Giacometti and a Selection of Contemporary Drawings. Alberto Giacometti is one of those iconic artists who, like Pablo Picasso and Marcel Duchamp, has become stalwart relics of a modernist age of artistic production by which any artist working today can easily say that they have been influenced. Giacometti’s emaciated androgynous bronze figures are easily recognizable and, in their time, stood as existential reminders of the horrors of World War II and the alienation of individuals in a modern world. In contemporary times, this trope of one becoming distanced from the world around us is all too familiar as our lives are further and further mediated by technology, namely the lack of human connection that comes from the rise of the internet and social media. Yet through the seemingly dark and dreary imagery there remains a sense of humanity that these figures possess; it makes look inward on our own way of life as we look outward toward the imagery he created. The stubborn humanity and personality that can be seen in Giacometti’s sculpture, paintings and drawings, like his Double Sided Drawing featuring Double Portrait of Diego and Standing Man Arms Outstretched (c.1947-1950), featured in the Norte Maar exhibition, which through its juxtaposition with the various contemporary drawings proves to be timeless and undying. The exhibition features ten contemporary artists, most of whom work in Bushwick, pand roves to be just as interesting as many of the actual characters in the gallery the night of the opening. Lively and invigorating as the night was, most of the pieces possessed a similar sobriety to the Giacometti by which they were all so inspired. 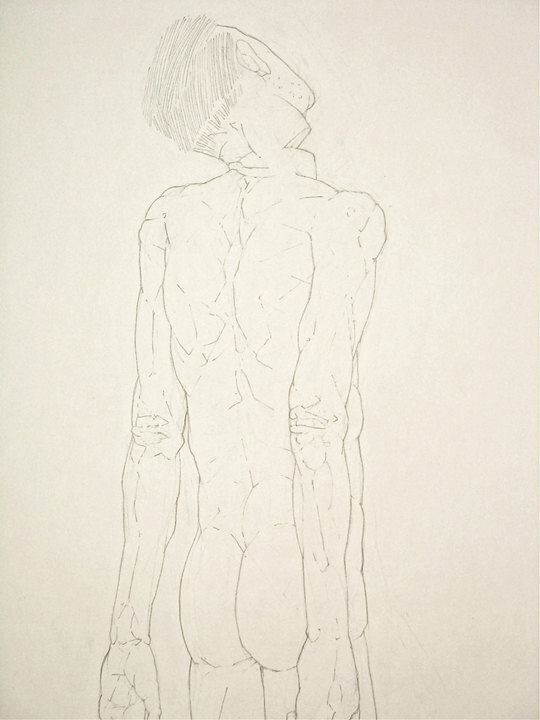 The two self-portraits by artist Matthew Miller, for example, capture a similar obsession with capturing the essence of the subject “until it resembled….the living presence perceived at one glance of the model,” as explained by the artist in the label next to the drawing. His emphasis is in capturing the concept or zeitgeist of the sitter, in this case himself, rather than an exact physical likeness. This plays directly into Giacometti’s understanding of the human spirit. His figures are at once anonymous, lacking any sort of description as to their identity, yet possess a familiar and striking universality. This is by far the most telling theme throughout the show, as with other artists such as Thomas Michelli’s Facing AG (2012), who takes the identity of his subject further by denying the viewer a clear sexual designation. 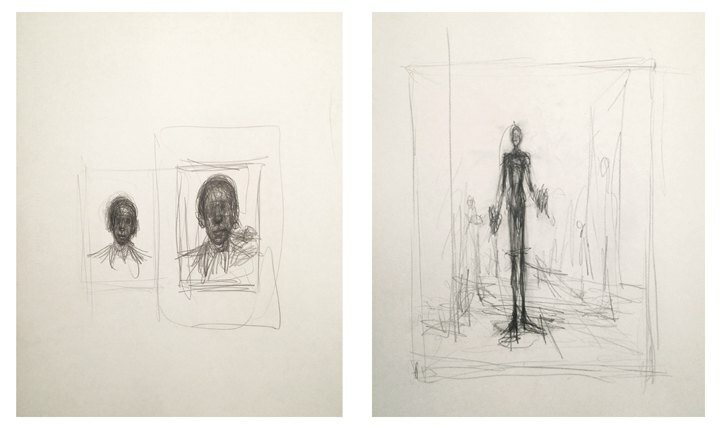 Michelli’s tendency to continue his drawing from one page to another, held together by push pins also adds to the artifice of the piece of paper on which he draws, clearly proving that his goal is not to draw an exact physical rendering of a subject. Detail of Thomas Micchelli's "Facing AG#2," 2012, graphite and pencil on paper. Other themes that permeated the show dealt with Giacometti’s constant play between substance and void, light and dark, and good and bad. These dualities that are so commonly felt across generations and national borders that they continue to prove relevant with this group of artists. 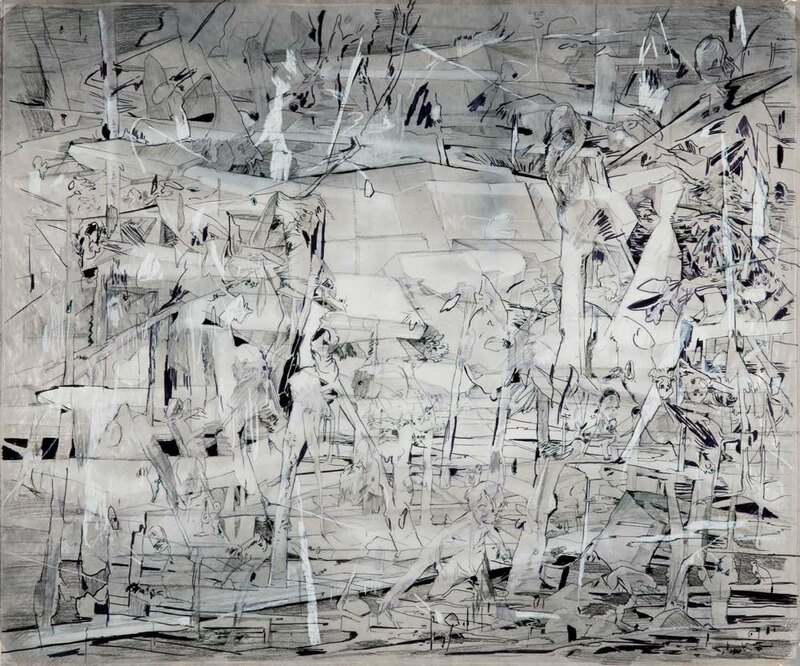 I was especially struck by Andrew Szobody’s drawings, whose obsessive halting lines create both a ground and void between them as they comprise a whole. By contrast, Francesco Longenecker presents his own concept of space by layering thin sheets of paper on top of one another creating a complex and non-definitive ground. Libby Hartle, one of the two women in the show, also challenges the viewer to perceive space, light, and dark in a different way. 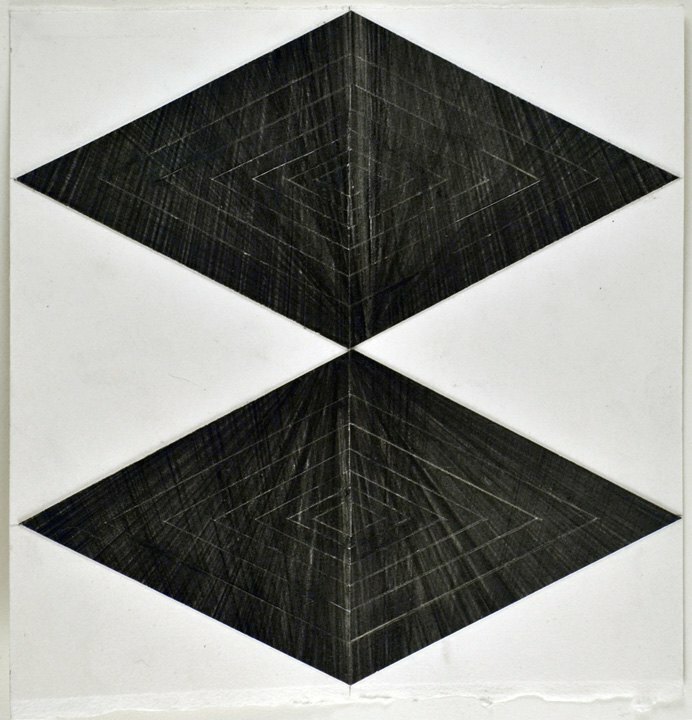 Her drawings, created from producing and reproducing the same shape in graphite, then cutting and reassembling the paper to create a new shape, seem to be completely black. Upon closer inspection, however, we can see the lines and shapes that Hartle has meticulously worked to recreate. In this exhibition, Norte Maar presents a mature and thought-provoking dialogue between contemporary drawing and Giacometti’s mid-century oeuvre. Giacometti’s uncanny ability to toe the line between so many dichotomies - light and dark, material and space, figuration and abstraction, good and evil - will likely ring true for generations to come. 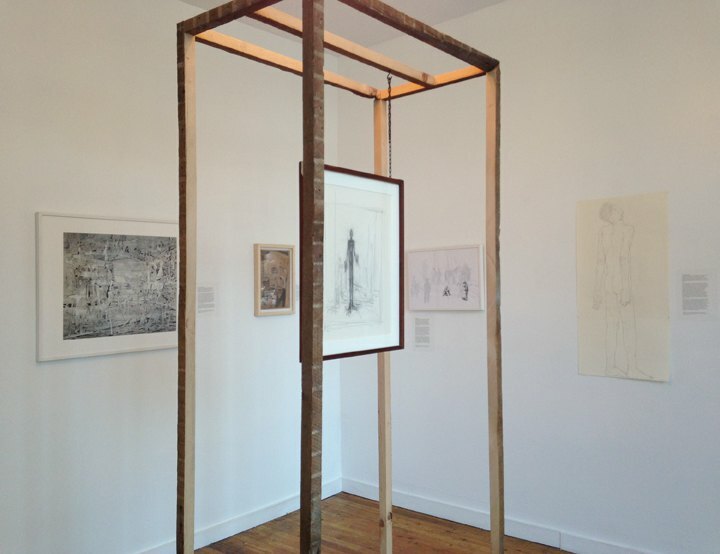 Giacometti and a Selection of Contemporary Drawings will be on view at Norte Maar until February 17. Norte Maar is open weekends from 1-6pm and is located at 83 Wyckoff Avenue, #1B. Check out also out interview with Norte Maae co-founder, Jason Andrew, on the origins of the gallery.